Frank Leavy’s handprint as seen in a (probably retouched for clarity) 1939 Chicago Times photo sent by a reader. It seems to be officially marked off by the fire department. No book of Chicago ghostlore is complete without the story of fireman Francis “Frank” Leavy. The story goes that one day in the 1920s, Frank was in the fire station, leaning his hand on the window and saying “this is my last day with the fire department,” or “I’m dying tonight,” or something equally cheery. That night, there was a massive fire that claimed the lives of several fire fighters, including Levy. The next day, his handprint was still on the window, and could not be removed. The print stood up to even the most abrasive cleansers until 20 years to the day after the fire, when the window was shattered by a paperboy. The story is part of Chicago’s folk mythology. So, what of Frank Leavy? Was this story real or not? Francis Xavier Leavy WAS a real person, and qualifies as a Chicago hero. He lived at 6507 S. Whipple, where neighbors admired his yardwork. 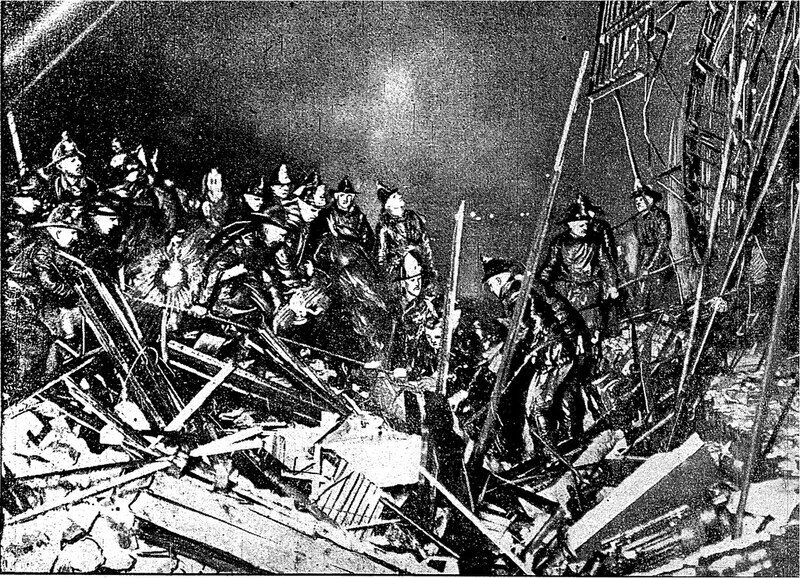 And the fire that killed him and six other fireman really did happen in 1924 at Curran’s Dance Hall on Blue Island Avenue. Leavey left behind a wife and two young children whose care was aided by massive drives in the city for aid to the fallen firemen’s kin. Here’s a photo of the fire – Leavy, as I understand it, was one of the seven firefighters killed when a wall collapsed. So the story may have been collected from oral tradition, but it also may well be pure fiction. But because of the story, thousands of Chicagoans who never would have heard of this heroic fireman otherwise know Leavy’s name, and the sacrifice he made for the safety of the city. Leavy’s badge on display at the fire training academy, which has the badges of nearly every fallen fire fighter (though some couldn’t be recovered and have replicas as stand-ins; this may be one of those). Photo by author, added 2016. If anyone has any backup for this story, please let us know! (note: the newspaper records of the fire usually spell his name “Leavey,” but the official records I’ve found with his signature spell it Leavy, which is out it appears in most books). (further note, added 30 march 2010: I’m thrilled to have heard from so many descendants of Frank Leavey who have confirmed that the handprint story has been going on for a long, long time! I’d still love to see a photograph of it or a contemporary account, but I’m certainly convinced that the story wasn’t invented for use in a ghost book). (further further note added 2015: a picture was recently found. It looks a BIT retouched (as newspaper photos often were in the 1930s for the sake of clarity), but the handprint was clearly not only real, but something the fire department venerated). This is a true story. I've done research on the Curran Hall Fire, and my great-grandfather was one of the fireman who was killed with Mr. Leavy. There is a photo of Francis Leavy in the Chicago Tribune (page 2, April 19, 1924 issue), and there are photos of the handprint in Fire magazine (Jan 1939 issue). He, along with the others, are recognized on the Chicago Fireman's Memorial, and their badges are on display in the Fire Academy. I've been working on getting the names of the 10 fireman added to the national fireman's memorial. If someone is a descendent of any of the firemen from Curran Hall, they can go to the "National Fallen Firefighters Project Roll Call" website to add their information to be informed of any future plans for recognizing them. And thanks for sharing this story, by the way… this one is very interesting because it also highlights some true Chicago heros. Frank x Leavy is part of my families tradition of service to Chicago an the country. This week we lost another member of the family my Uncle Russ – Chicago Firemen Russell J. Leavy Sr. . His father also was a Chicago firemen Russell Leavy SR my Grandfather proceed him. Russell J. Leavy Sr., loving father of Therese (Ray) Leavy Terrones, Russell J. (Angeline) Leavy Jr., James W. (Elizabeth) Leavy, Michael U. Leavy, William J. (Joellen) Leavy, Suzanne M. Leavy, Thomas M. Leavy and Kathleen (Mark) Leavy- Mouzakis; proud grandfather of 18; dear brother of Margaret "Peggy" Leavy and his late twin brother Edward Leavy. U.S. Marine Veteran, former Chicago Fireman. Memorials to N F Midwest or Make a Wish Foundation, would be appreciated. Funeral Saturday, 9 a.m. from Hickey Memorial Chapel, 4201 W. 147th St., Midlothian to St. Christopher Church, 9:30 a.m. Mass. Interment St. Benedict Cemetery. Visitation Friday, 2 to 9 p.m. 708-385-4478. My dad was a Chicago Fireman (deceased) I remember the story and remember seeing a copy of the story with a picture of it in a Fire Department newspaper. Mr. Leavy was the best man at my grandfathers wedding (John Nachel). We always heard about the story of the handprint from my grandfather. Yes, the story of the fire is certainly true – Leavy's name is all over the records, including newspaper accounts of the fire, the fireman's monument by the stockyard gates, etc. I was unsure before I did the research because PLENTY of ghost stories that are going around had no basis in fact. Did your dad ever see the hnadprint? I'd love to hear about it from a first-hand witness; no one seems to have a photo of it. This story actually IS true. Frank Leavy was a real person, and i know this because he was my great uncle. i found this story in a book, and i asked my dad about it and he told me that there really was his hand print left on the firehouse from the day he died.